to Gradfinder.com now charging to email! Meetings held:- Friday afternoons from 4.15 p.m. to 5.30 p.m.
at:- 8th Hillside Scout Hall. We are a fairly large Pack of Cub Scouts aged between 8 - 11 years who meet on a Friday afternoon to do a lot of fun things like learning how to do knots, going camping, abseiling, first aid, making tea, making crafts and lots of exciting things. Any queries, please call + 263 91 221 699. Friday 14 May Annual General Meeting at 5.15 p.m.
9 - 11 July Camp at Gordon Park. 1886 Hillside Cub Pack Report! 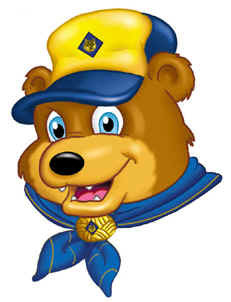 Penny currently runs the 8th Hillside Cub Pack and can be contacted on Cell 091 221699. She is helped by Wendy Mackenzie. My Mom (Val) was Akela at the 8th before emigrating to South Africa. I (Charmaine Crawford) was born in Bulawayo, Zimbabwe and was a member of the Hillside Guide unit with Sue Harvey as Leader and received my Baden Powell Award... I spent many memorable years at Gordon Park. I moved to Canada in 1988 and joined Guiding here. I am now a leader with Scouts Canada. My brother (Brendon Fisher) was also a member with the Hillside cub troop. I would love to get in touch with some of the people there, not sure if you would know where any of them are. Natalie Arrowsmith (Schmidt) , Rob and Andy Blundell, Sue Harvey and Norm Scott. I am also interested in getting in touch with a Beaver/ cub pack so that our group can write or e mail back and forth. I think it would be interesting for the kids especially as we are celebrating 100 years. If you could also let me know who to contact about getting some 100 year celebration badges for my Camp Blanket, I can see about sending some of ours to you if you are interested. I appreciate any help you can give me.